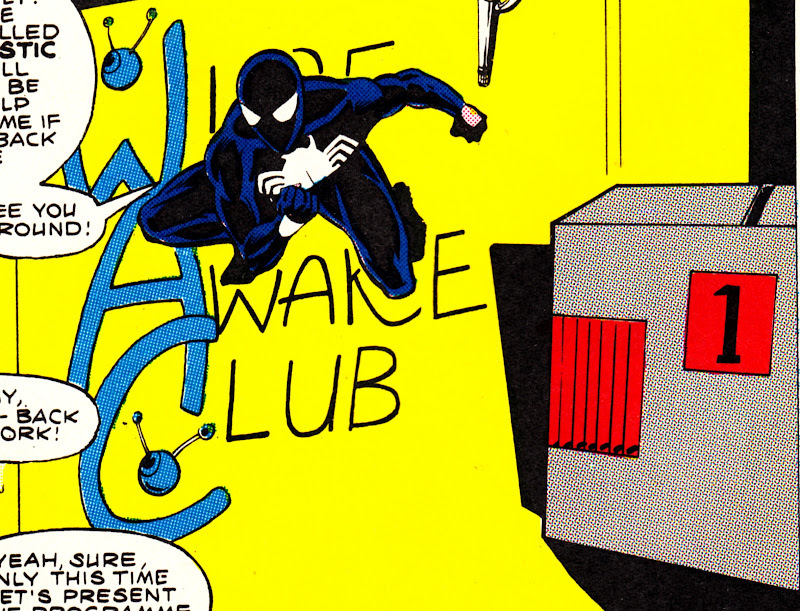 Here's Spider-man's little secret! 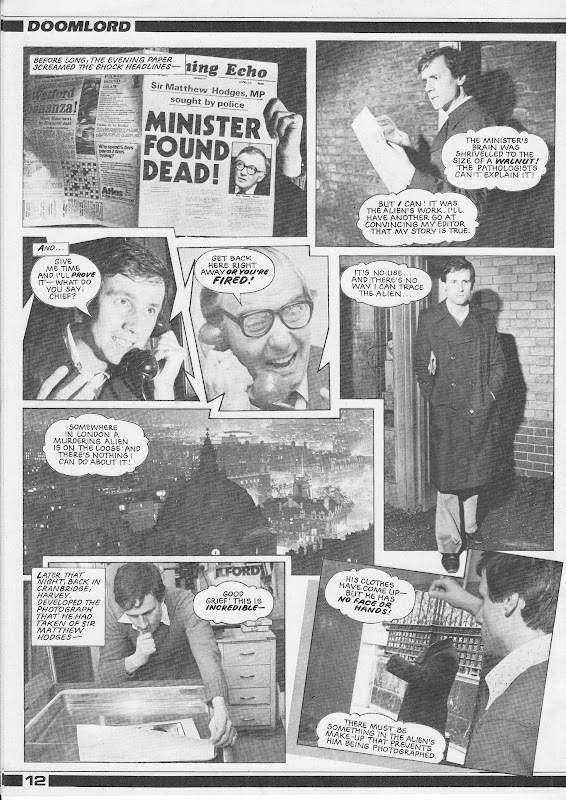 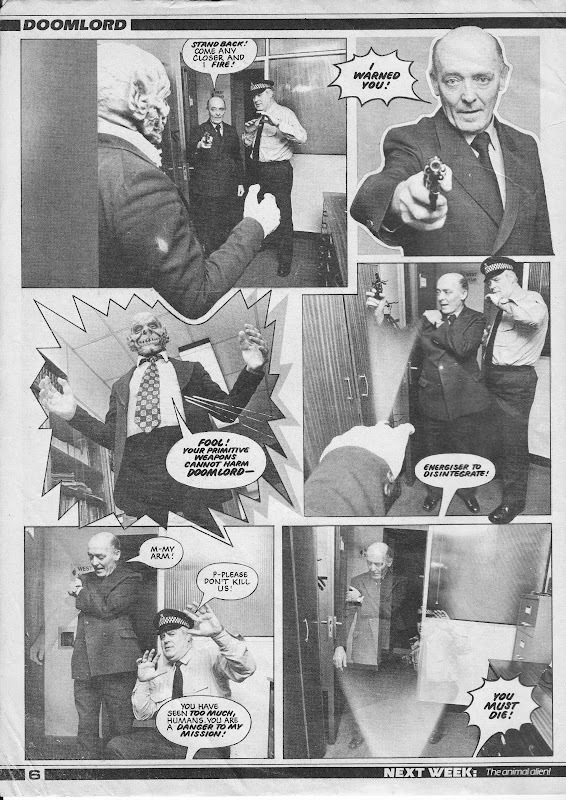 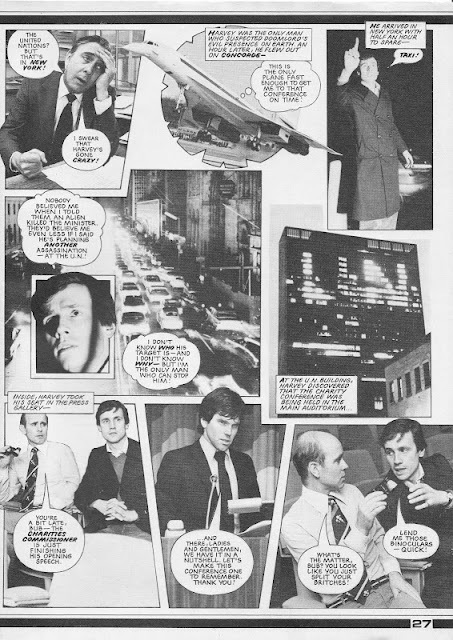 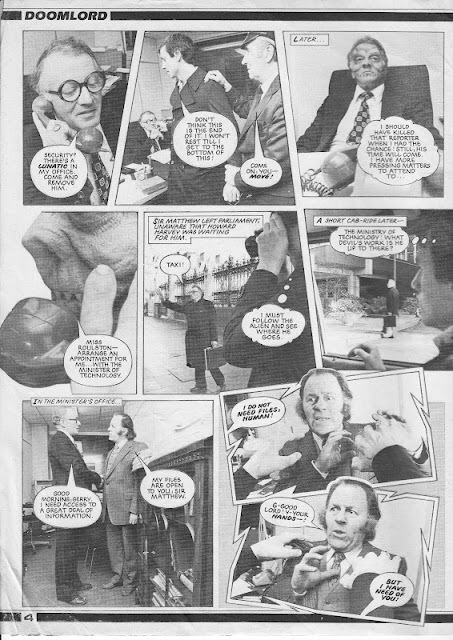 Here's a three-page Marvel UK SECRET WARS exclusive strip, penned by Marvel USA Editor-in-Chief (and Secret Wars scribe) Jim Shooter himself, created on TV-am's (ITV's national breakfast broadcaster) WIDE AWAKE CLUB (or WAC for short). 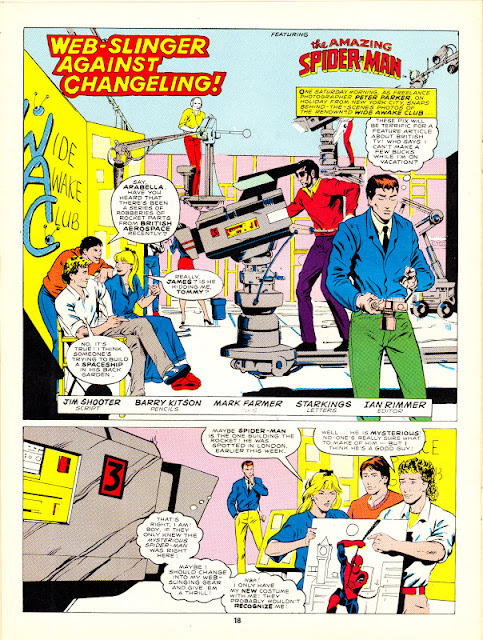 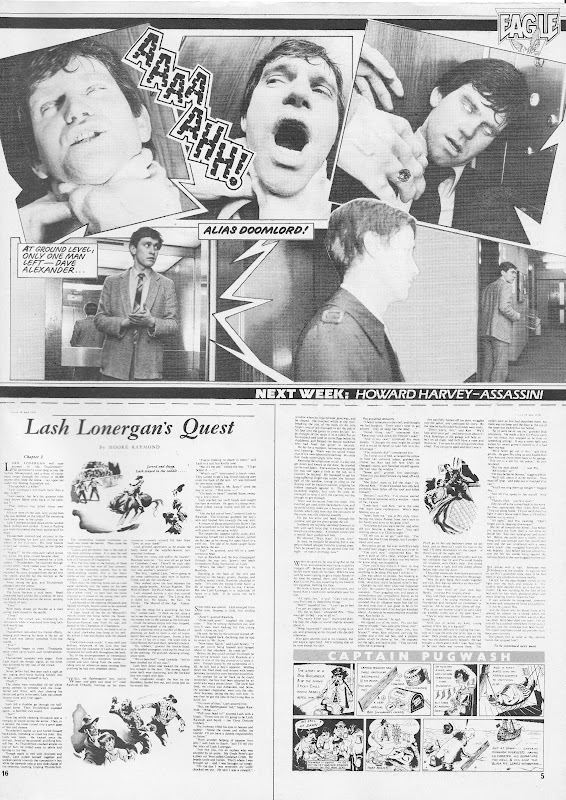 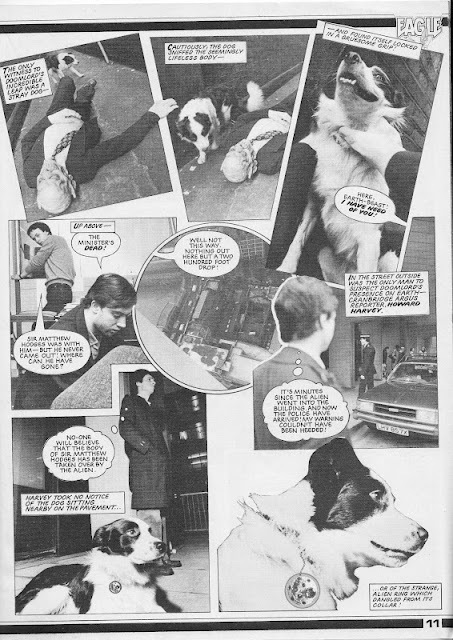 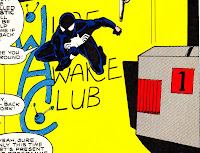 The Wide Awake Club aired live on Saturday mornings and Jim Shooter and UK artist Barry Kitson appeared live in October 1985 to promote Marvel UK. 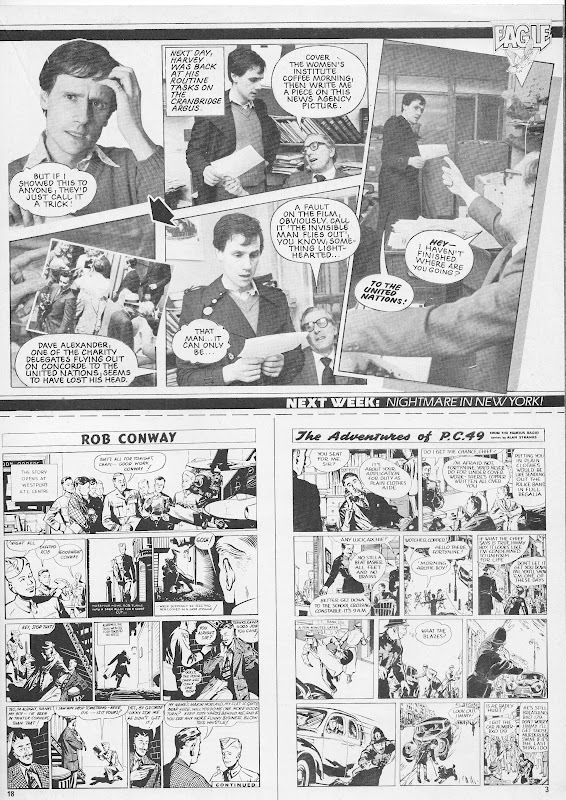 As part of the appearance, Kitson started work on this strip which appeared in SECRET WARS issue 25 (21 December 1985), and nowhere else. 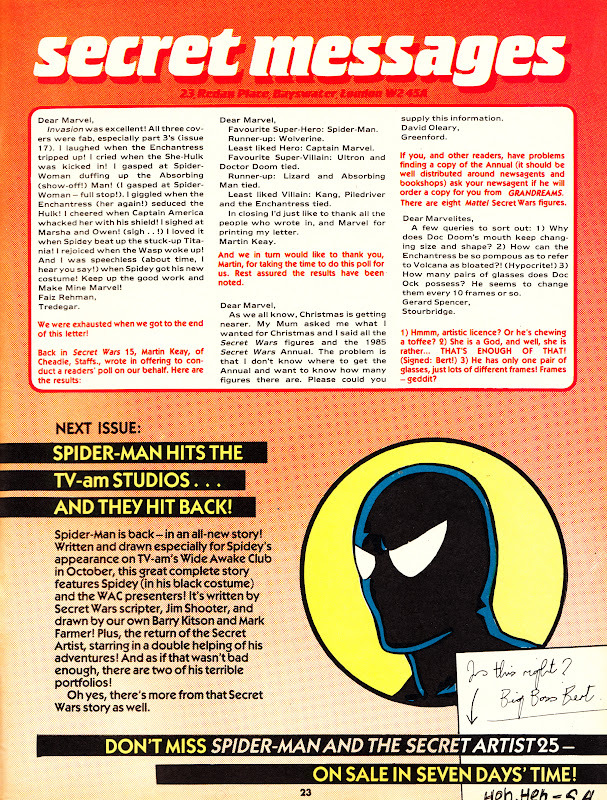 The strip appeared one week after Spider-man's own weekly (languishing under THE SPIDEY COMIC title) finally shuttered after 666 issues making it an unofficial (and short-lived) merger. Here's the preview from SECRET WARS issue 24. 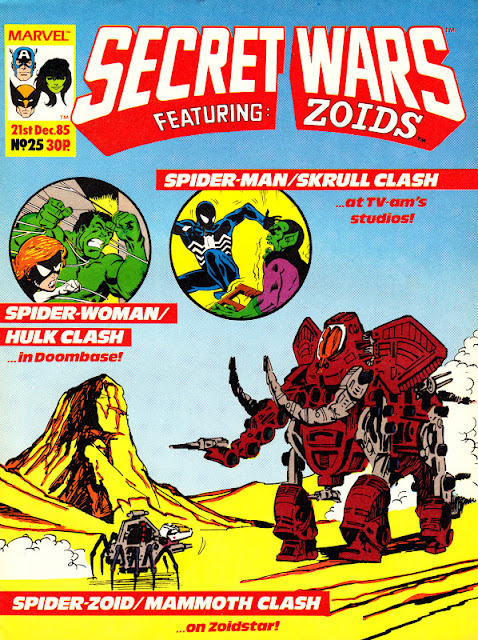 More from the Secret Wars... Coming soon. 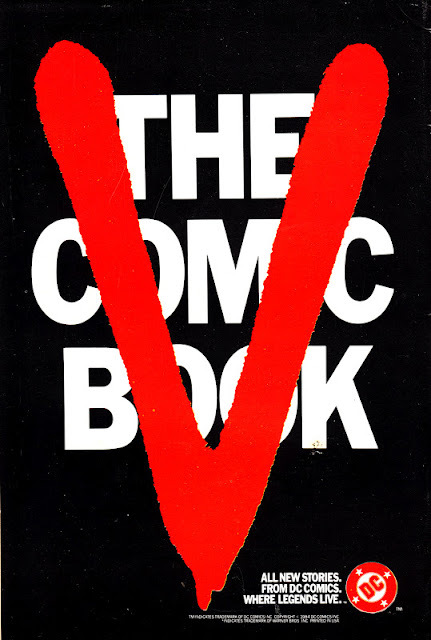 As a postscript to Slow Robot's V: THE COMIC BOOK coverage, here's the one-page advert promoting its launch. 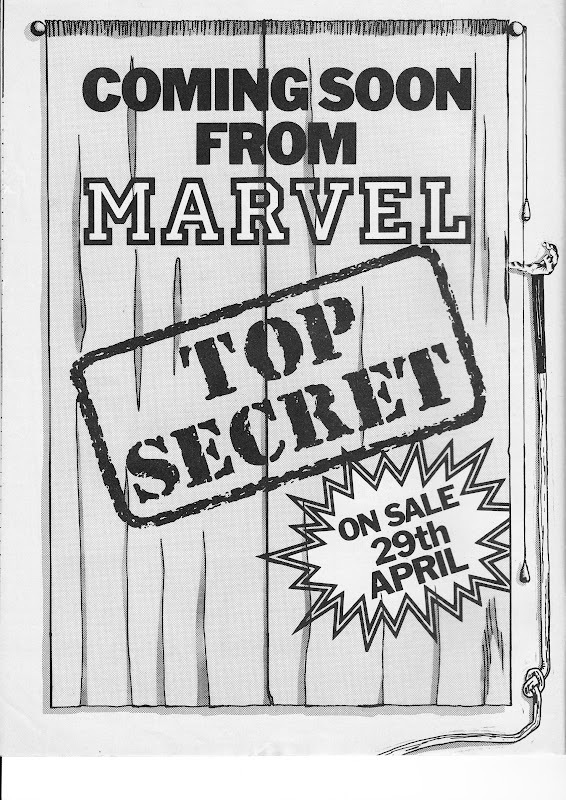 This particular scan came from the back cover of COMICS INTERVIEW 16, October 1984. 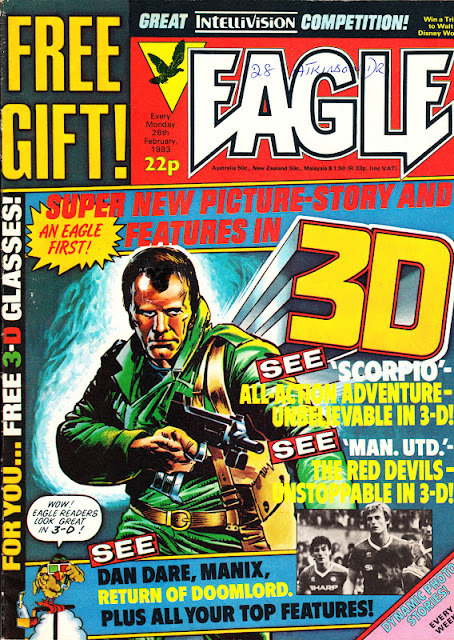 It's 1983... and 3D! 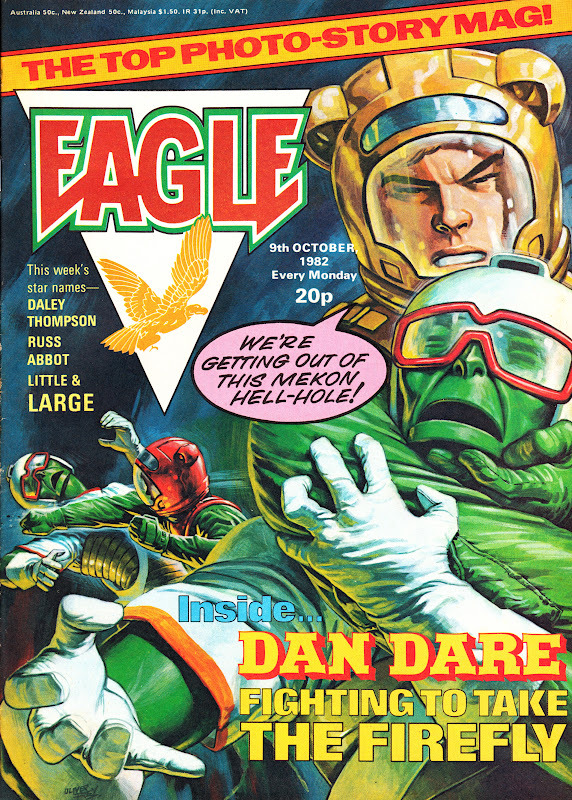 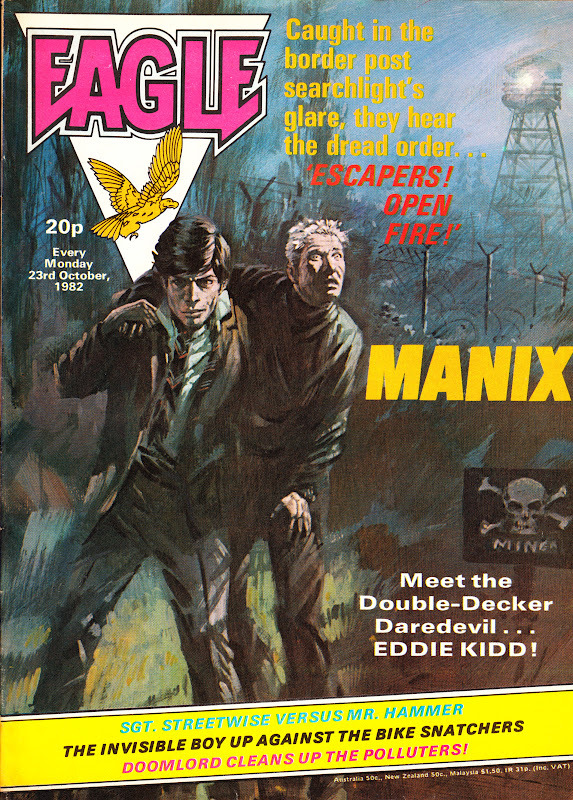 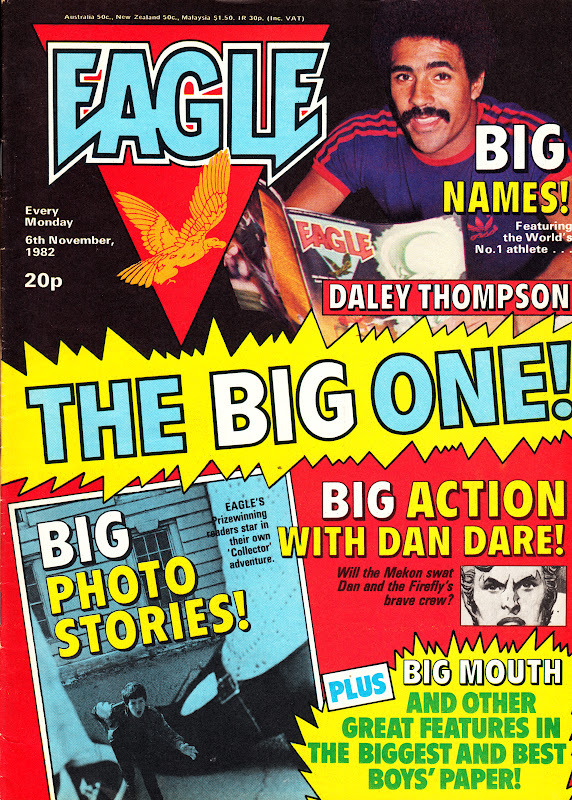 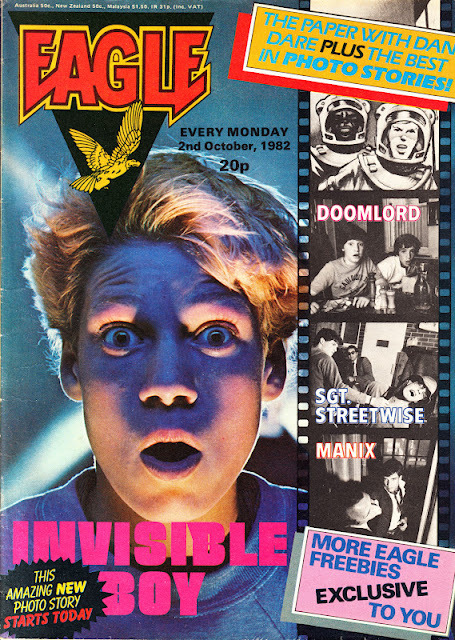 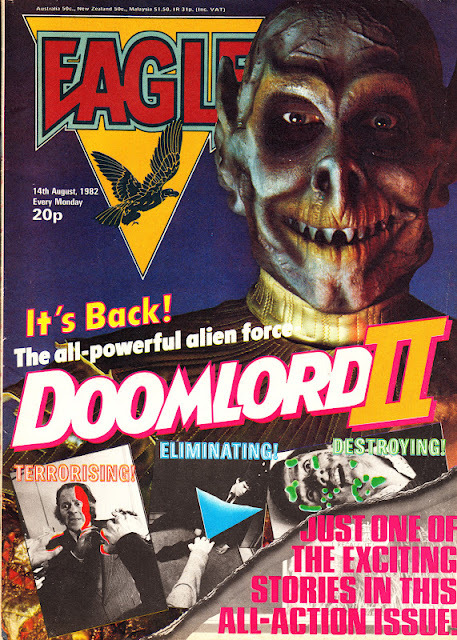 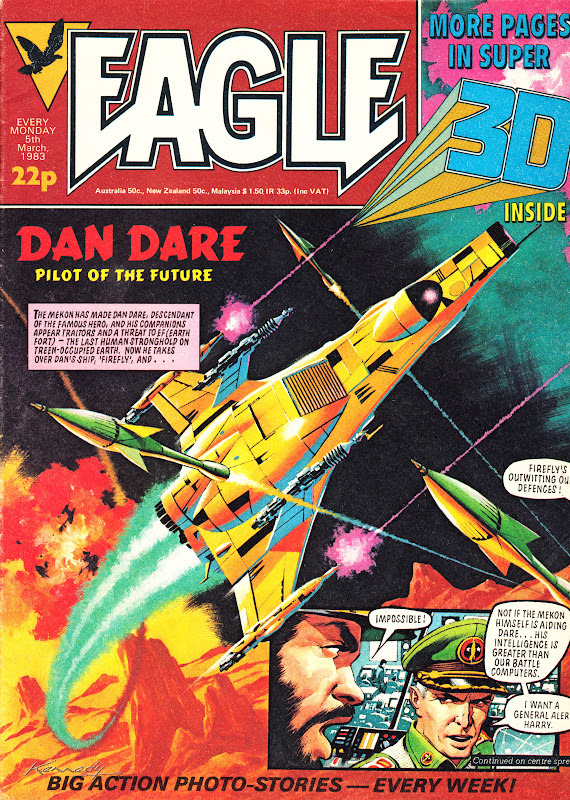 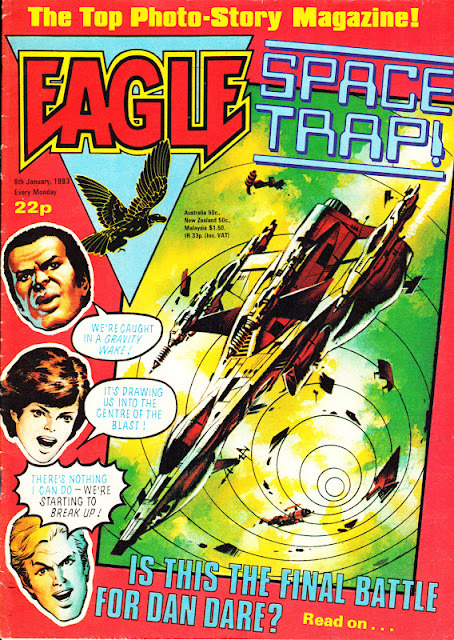 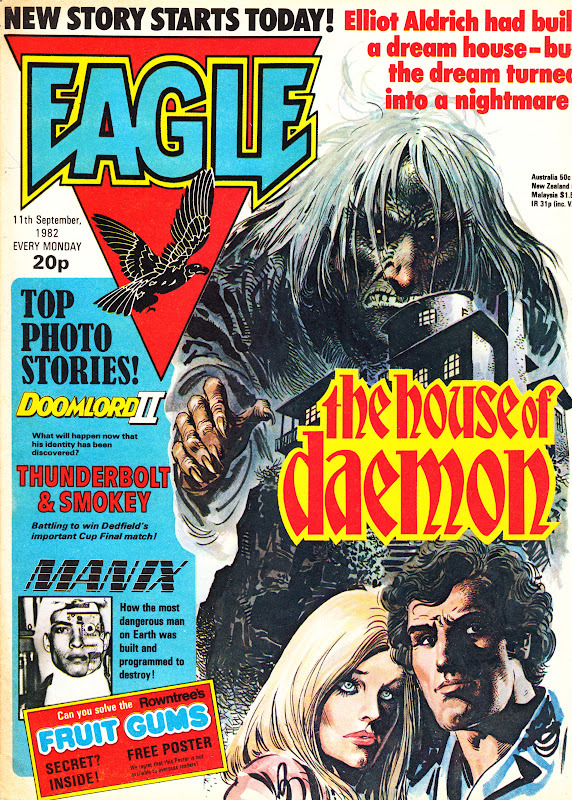 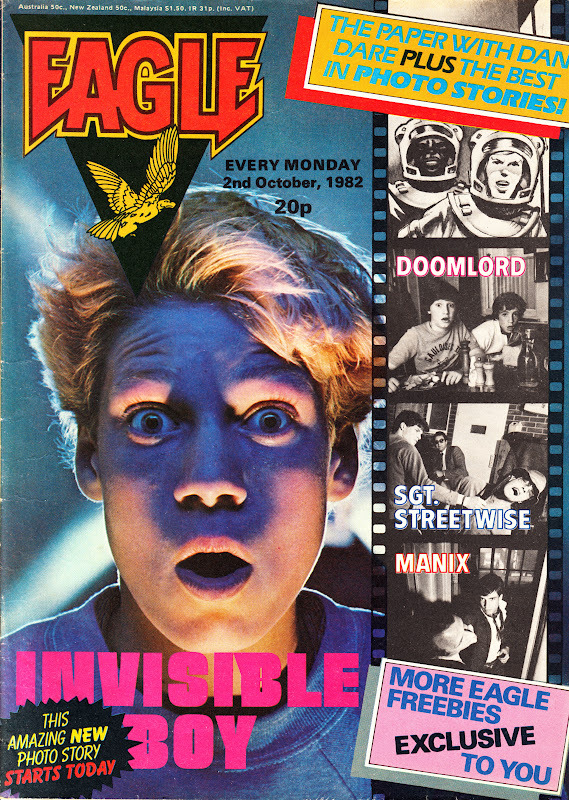 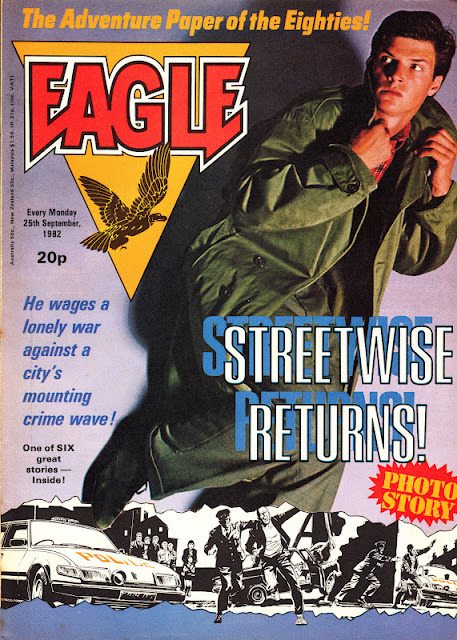 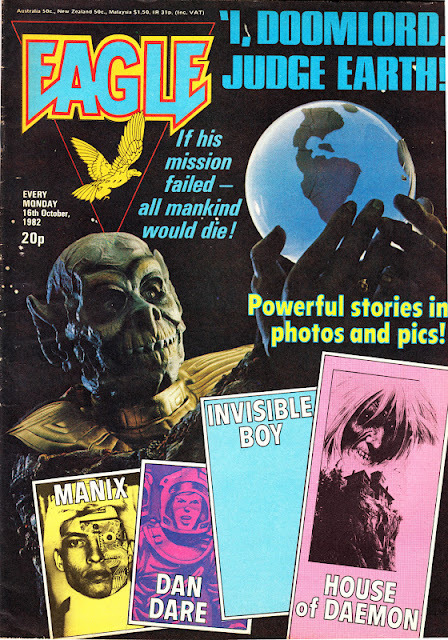 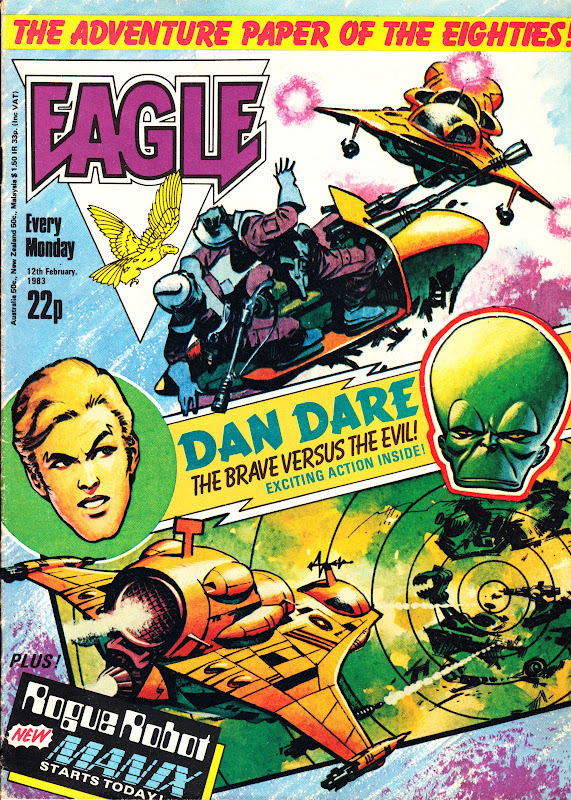 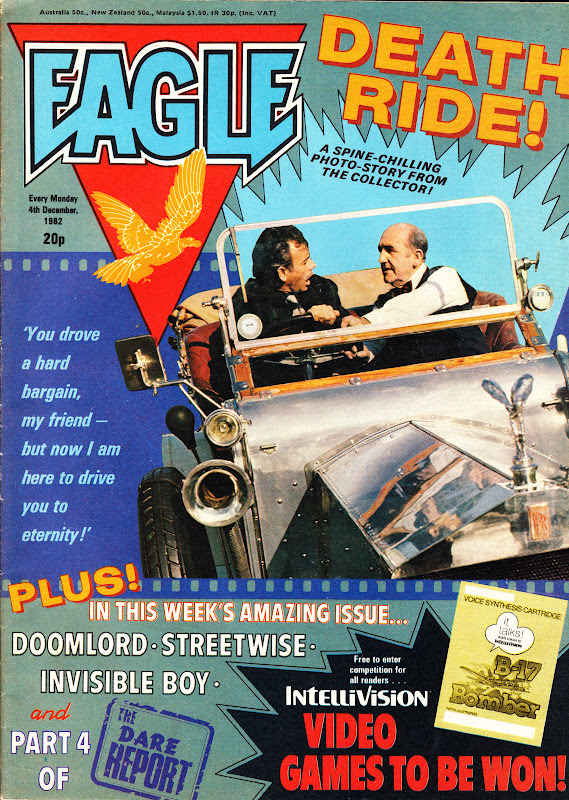 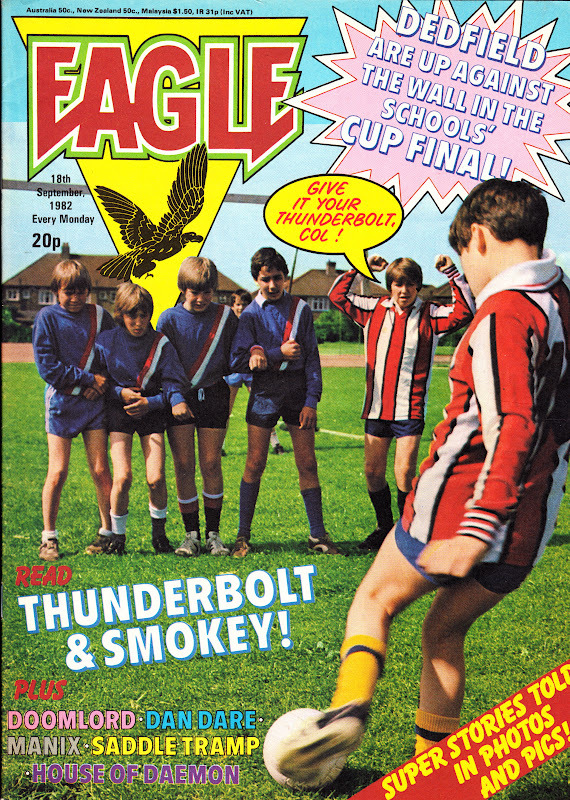 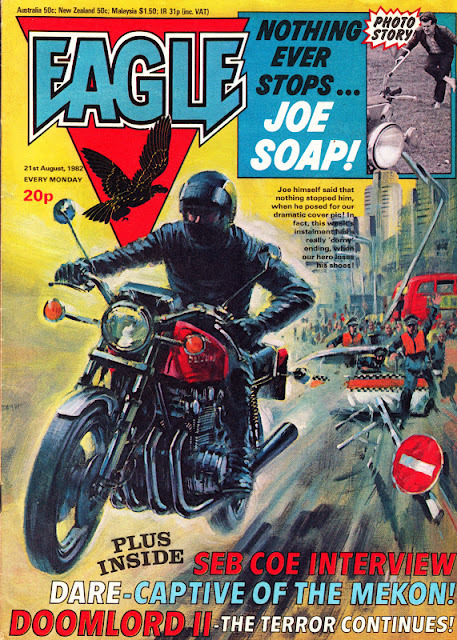 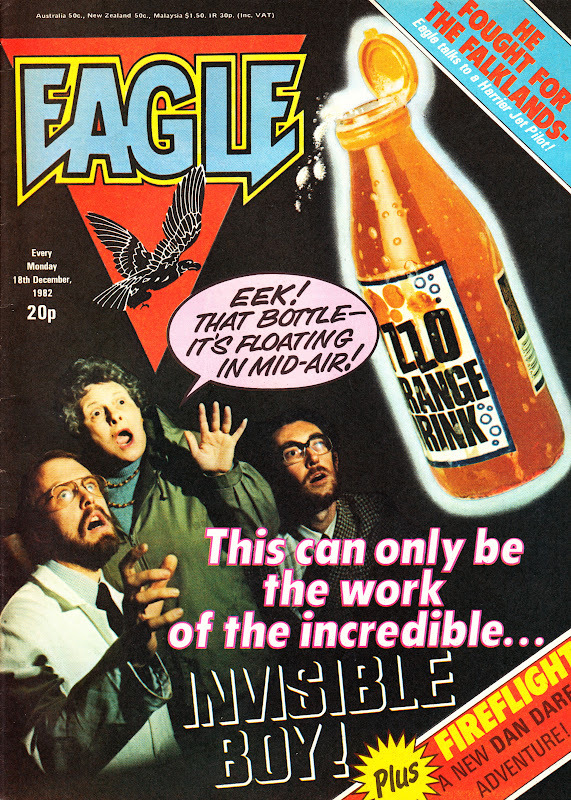 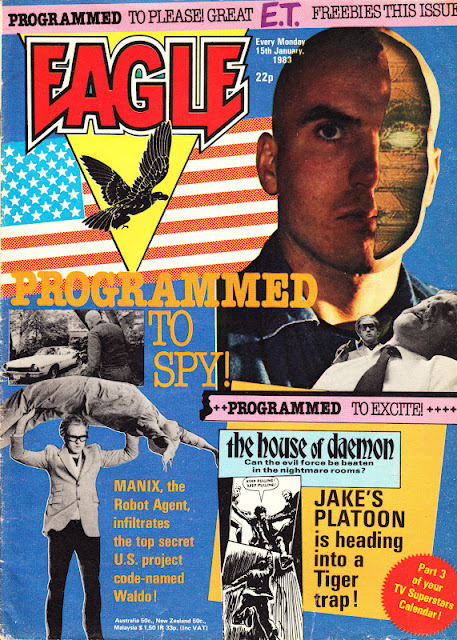 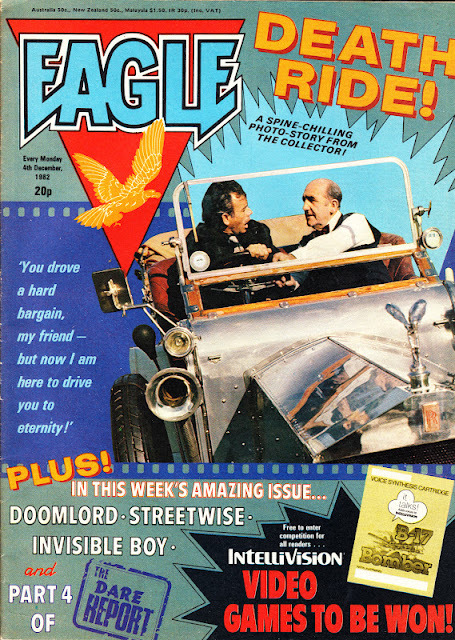 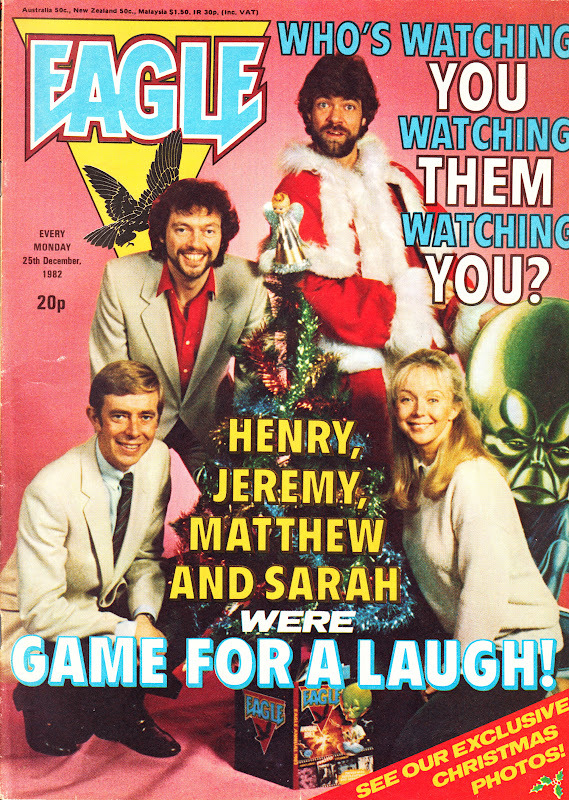 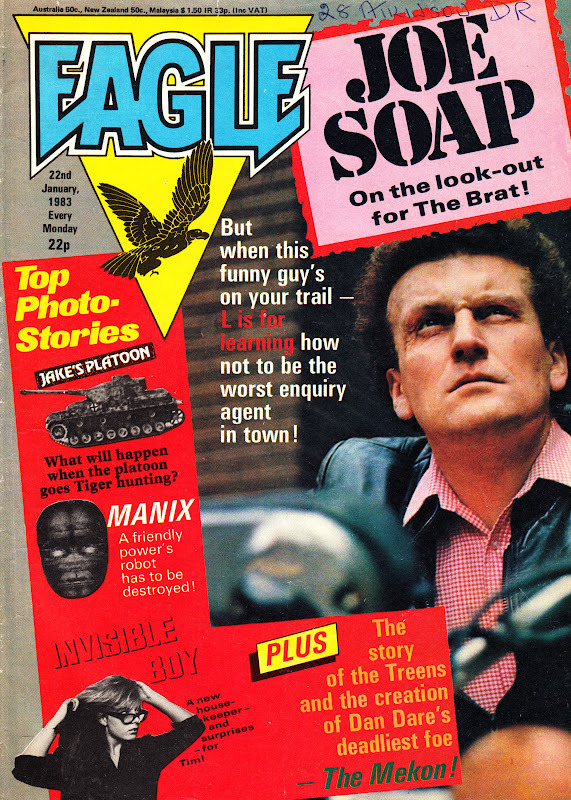 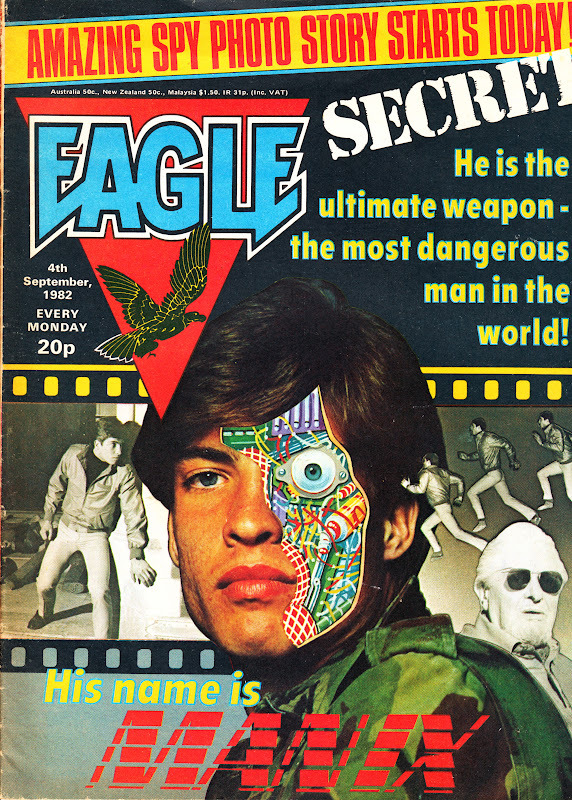 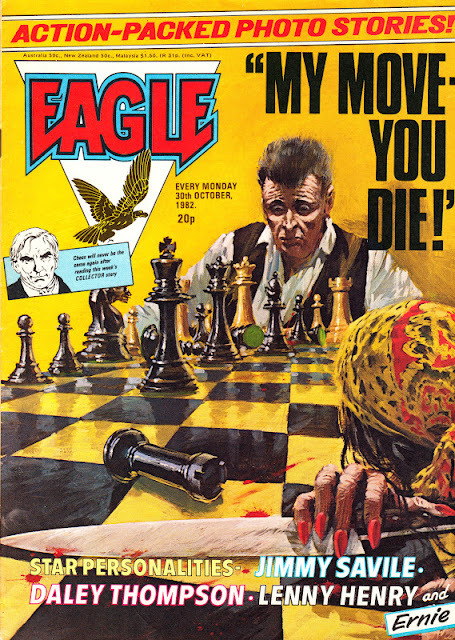 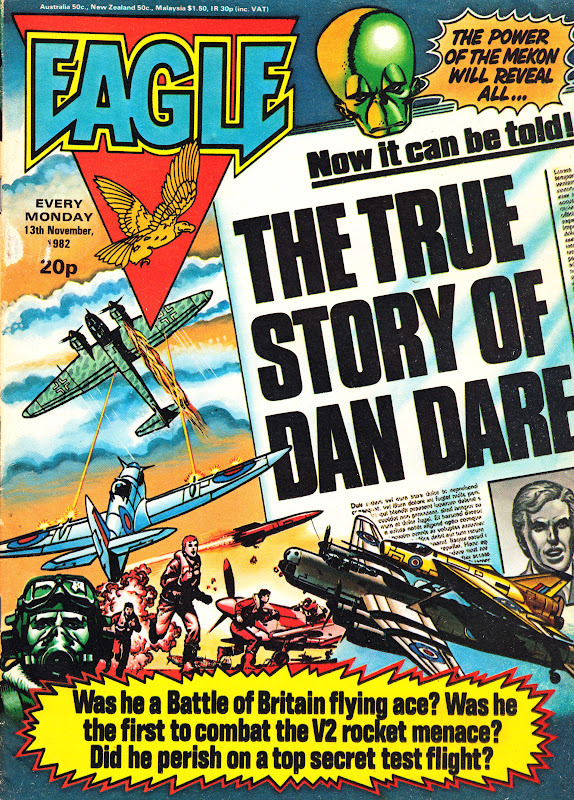 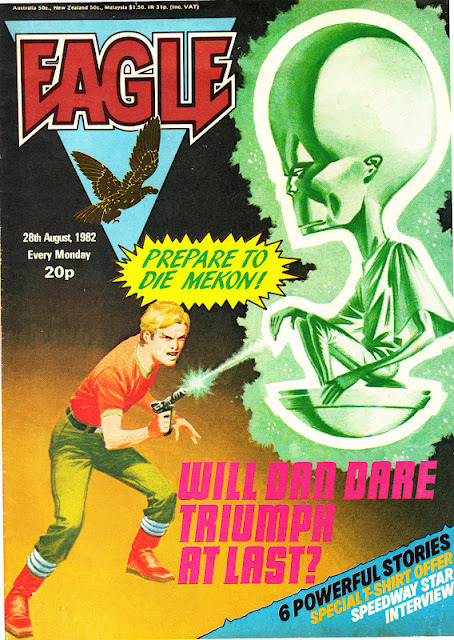 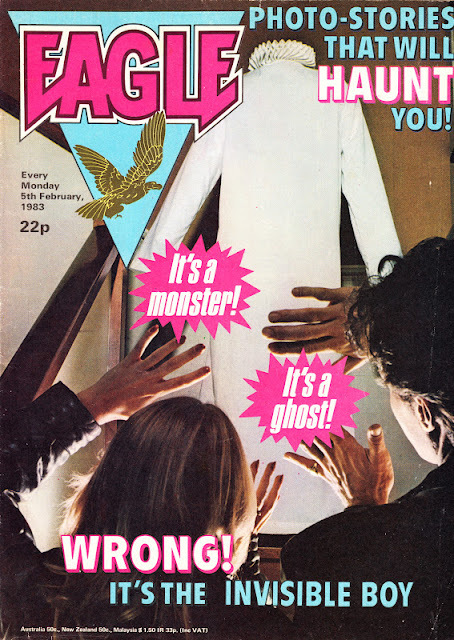 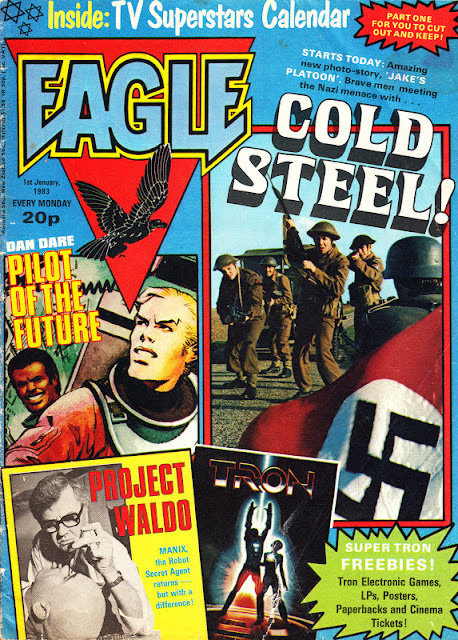 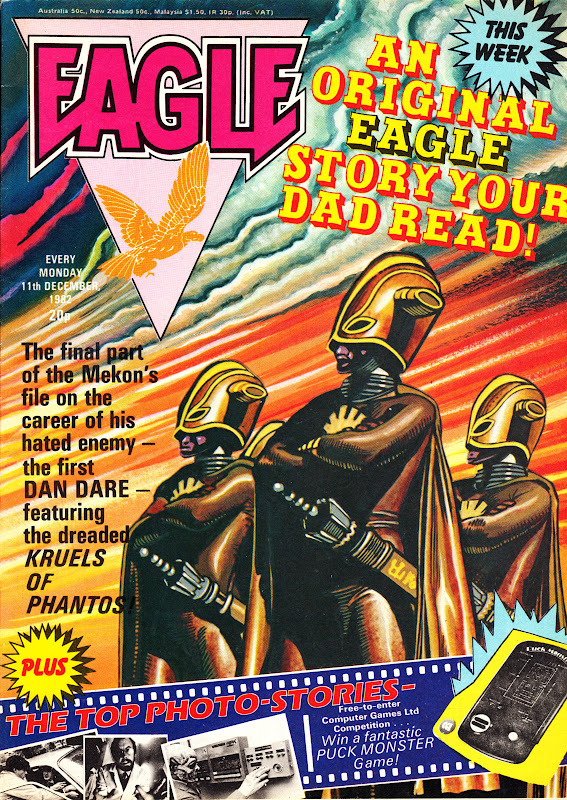 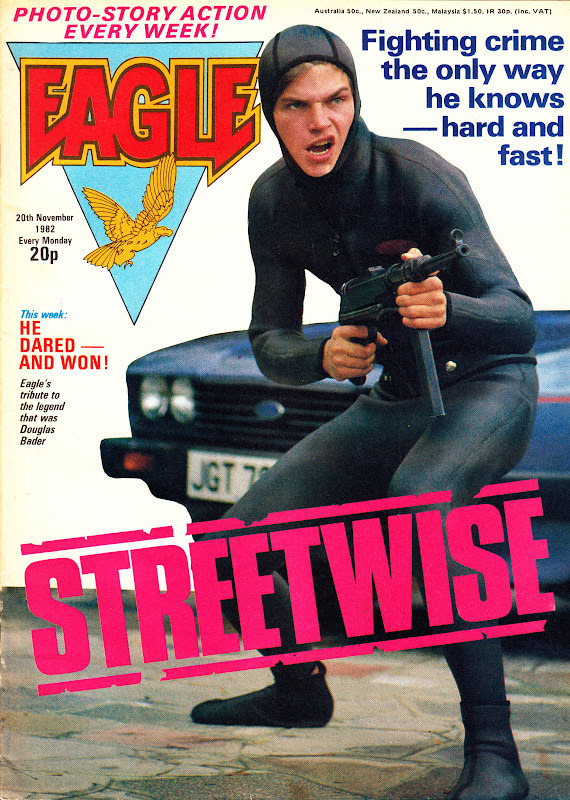 The EAGLE's second year on the shelves saw new(ish) innovations (a three week run of issues with selected interior pages published in headache-inducing 3D*), a budget-scrunching relaunch, yet another freebie spinner and, eventually, the conclusion of Return of the Mekon. FREE GIFT: Cover-mounted 3D glasses. Some interior pages printed in 3D. 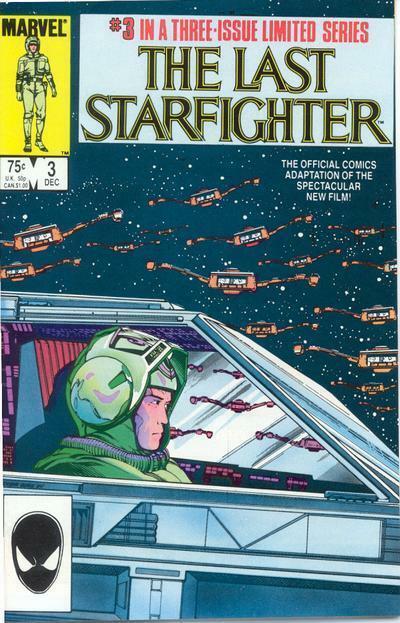 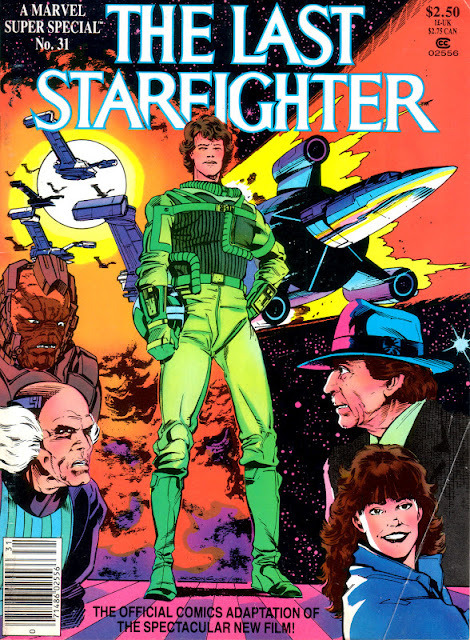 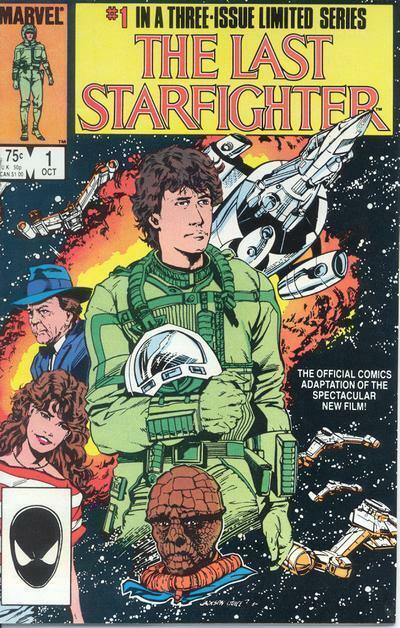 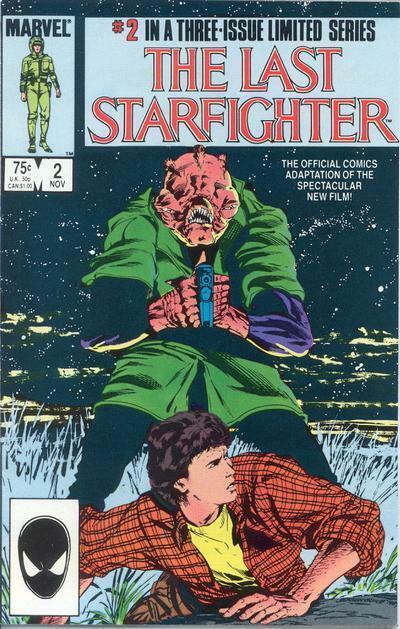 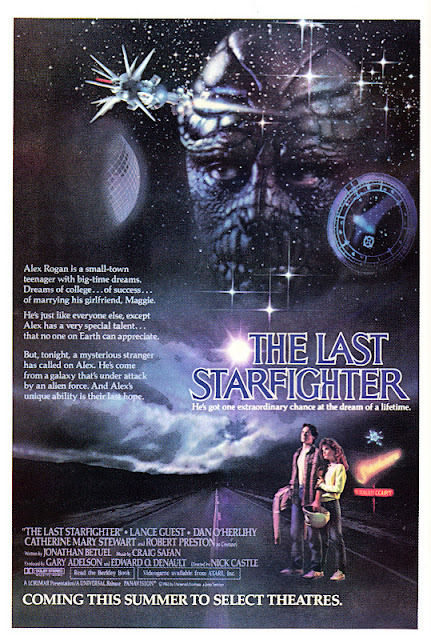 Here are the US editions of Marvel's THE LAST STARFIGHTER movie adaptation. 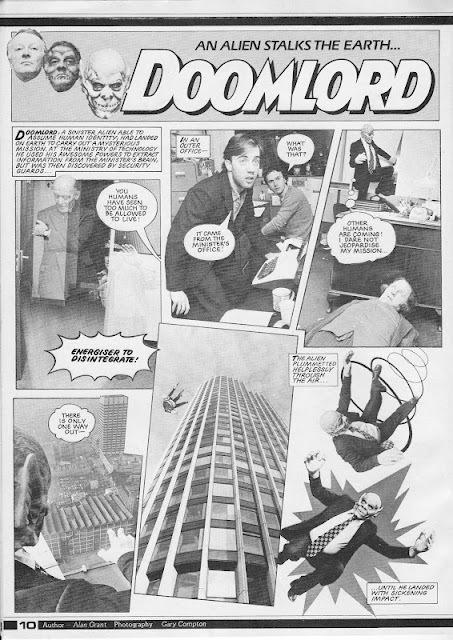 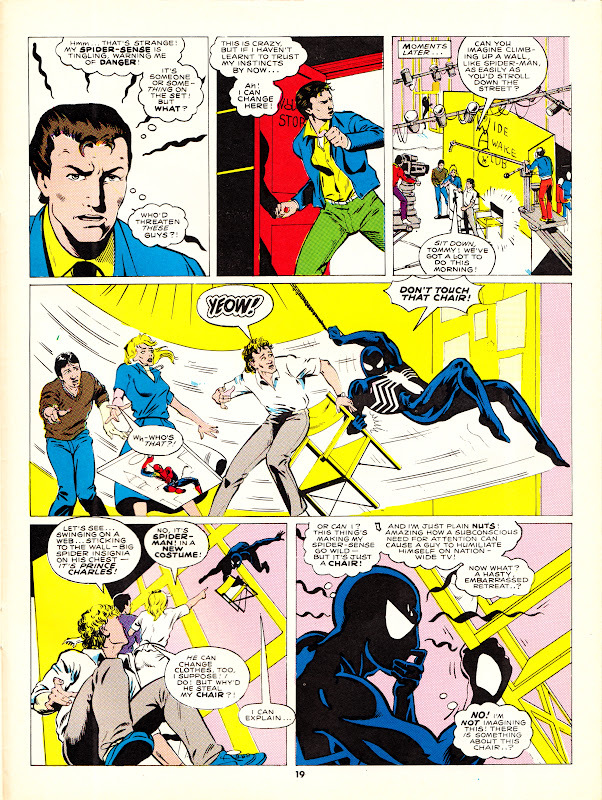 Following the tried-and-tested release pattern, the whole strip appeared as an issue of MARVEL SUPER SPECIAL as well as being chopped into three chapters to appear as a regular-format limited series. 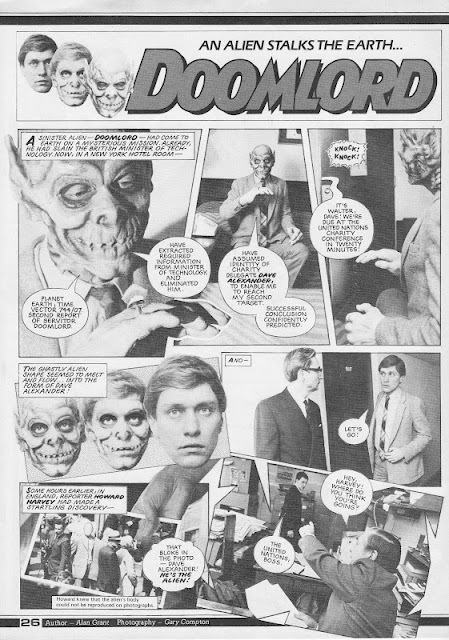 None of these received UK distribution outside specialist comic book stores but the strips were serialised (in even smaller chunks) as a back-up strip in SPIDER-MAN. 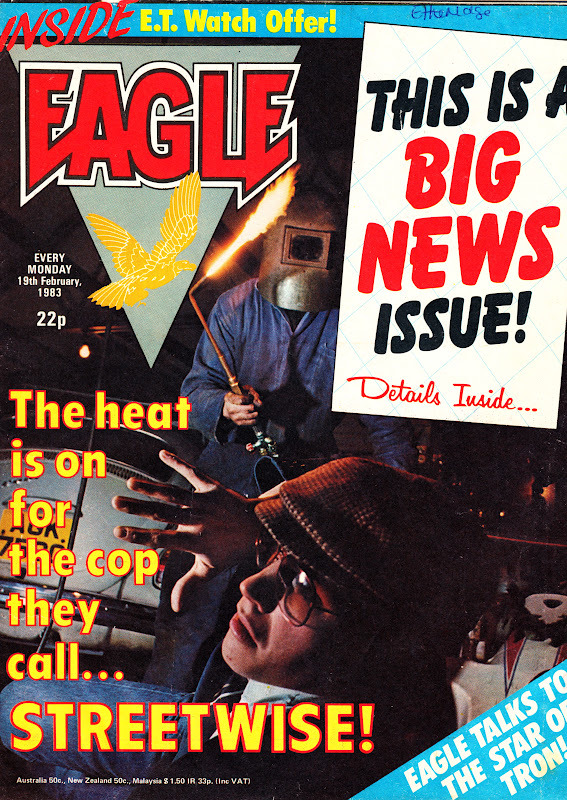 EAGLE's ace actors and cameraman didn't travel far for this episode: That's IPC's HQ, Kings Reach Tower (also home of Tharg's Nerve Centre). The bottom-right panel is clearly taken from the roof (that's LWT's, now ITV's, South Bank headquarters and studios in the distance) and the next panel clearly shows KRT itself. 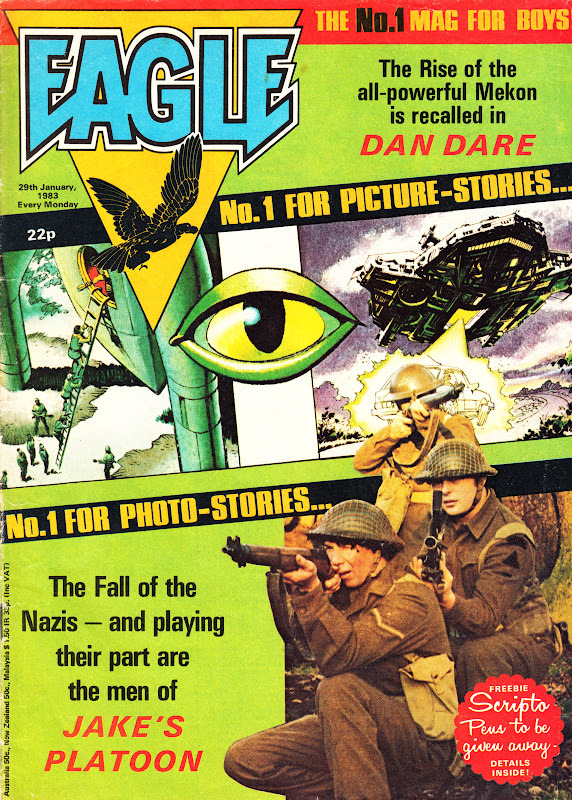 (Apologies for the lack of an EAGLE cover gallery update today, Blogger is reluctant to upload large images files. 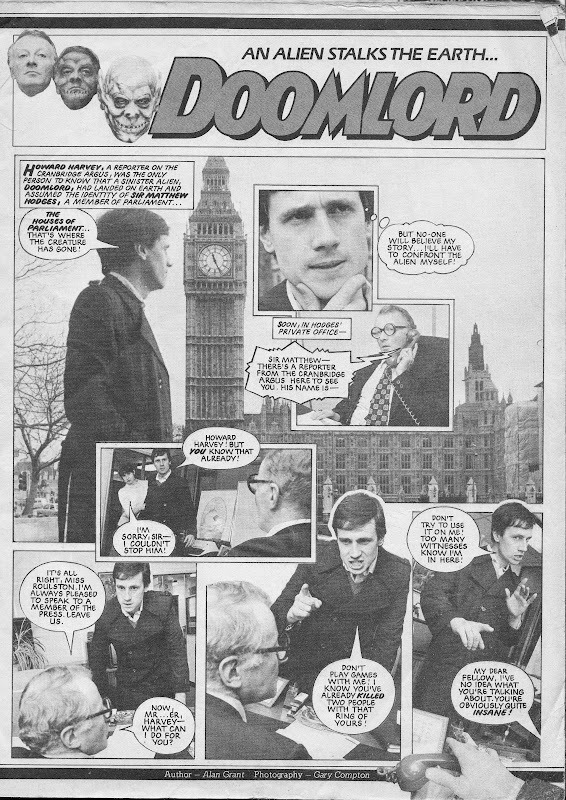 With luck, normal service will be resumed tomorrow). Here's the advert for the movie THE LAST STARFIGHTER, released in 1984. The advert ran in US comic books. Marvel adapted the movie as a one-shot SUPER SPECIAL and a three-issue limited series. 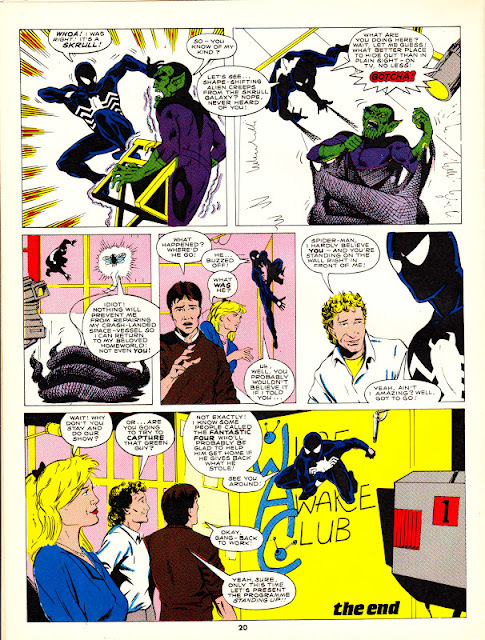 The adaptation was serialised in Marvel UK's SPIDER-MAN weekly. Here's the UK edition of BATTLETIDE, published by Marvel UK in 1993. 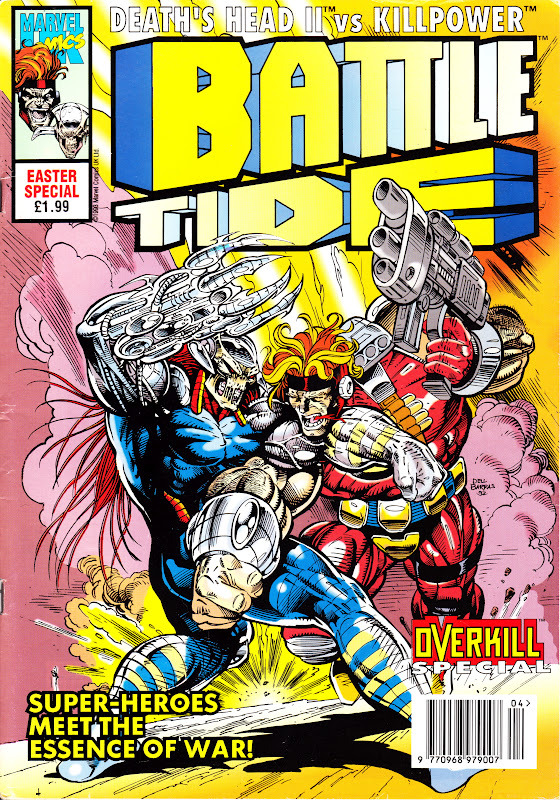 The hefty one-shot special collected the four-part US format limited series (starring Killpower and Death's Head II) for British readers. 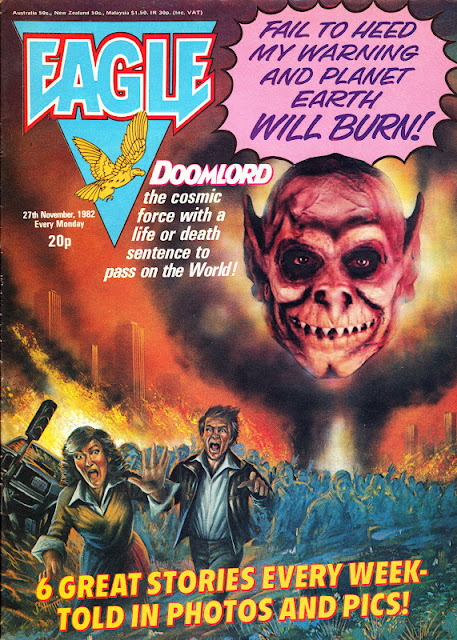 It was the only OVERKILL spin-off. See all of Marvel UK's US-format releases here and here.